Australian politics doesn't really do nuance. If a minister wants to get a message through to the voters, they forget the dog whistle and go straight for the foghorn. That tactic has been firmly in action this week, as the government declares that paedophiles, rapists and murderers will come into the country as a result of it losing a vote on the medical treatment of refugees. 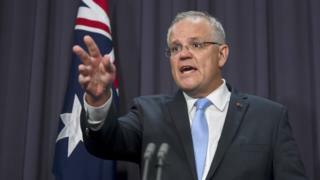 Prime Minister Scott Morrison warns people-smuggling operations out of Indonesia will resume immediately, asserting that many more asylum seekers will start heading to these shores. The mini-crisis of losing a parliamentary vote has been turned into a national emergency, as ministers raise the stakes on border protection. One of the country's biggest-selling newspapers printed a cartoon depicting an asylum seeker rabidly chasing a terrified female doctor - concluding that this would be the consequence of the vote. Australia - which politicians of every stripe here routinely refer to as "the greatest country on Earth" - is once again, it seems, under attack from mysterious, malign forces from outside. As in many developed countries, immigration controls are presumed to be a vote-winner in Australia, and so politicians know they need to sound tough. Back in August 2001, John Howard's decision to refuse a boat carrying more than 400 rescued refugees permission to dock drew international criticism from the UN and others. But in Australia it succeeded in rallying support for his government, which had been trailing in the polls. Mr Howard went on win the election a few months later and stopping boats became a central tenet of immigration policy. So too did his pledge that "we will decide who comes to this country and the circumstances in which they come". Leaders from both sides of politics have stuck to this - in 2013, as he sought re-election, Labor PM Kevin Rudd made his own "very hardline decision" as he called it. Mr Rudd announced that any asylum seekers who arrived by boat would have "no chance of being settled in Australia" even if they were found to be refugees. Instead, they would be assessed offshore in Papua New Guinea, and offered resettlement there. Australia may be an "immigration nation", but its politicians regularly return to the canon of the country needing stricter controls on who else is allowed in. Amid the government's poor polling, its perhaps not surprising that Scott Morrison has seized the opportunity of putting border security back at the centre of the debate in the lead-up to an election expected in May. Of course many voters may well care most about schools, hospitals and the basic infrastructure of everyday life. In time they will be reminded about the state of the economy and the predicted budget surplus. But in his recent speech to the National Press Club, Mr Morrison decided to emphasise all the existential threats he sees to Australia's prosperity. He listed "radical Islamist terrorism; people smuggling; natural disasters; organised crime; money laundering; biosecurity hazards, cybersecurity" and half a dozen others. In case there was room for doubt, he described the world as being "dangerous, uncompromising and, at its worst, simply evil". The message was loud and clear: changing governments in May would put everything voters know and love at risk. It's not subtle - and wasn't intended to be - as speeches have to break through all the noise and clutter of modern-day media. But it sets the tone for the months of election campaigning ahead, as the politicians try to persuade voters they are the only ones to trust.